I wanted to try some cogs I had diecut last week... Since I was planning to make a mess, I dug into the de-stash drawer and took a miss stamped piece of card. I also ventured to something I haven't tried before... flowers! I've had a small pack of roses in a drawer waiting to be tried out, and now I'm hooked... got to get me some more :) Here's what it turned out like: quite nice, eh? 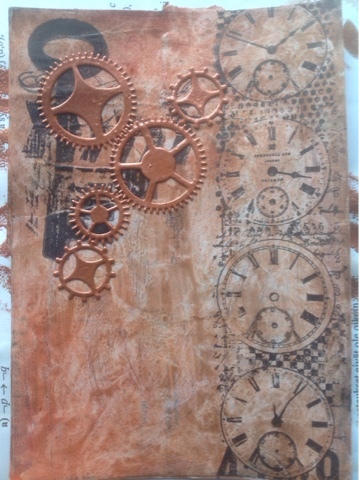 The cogs had been die cut from thick white cardstock. 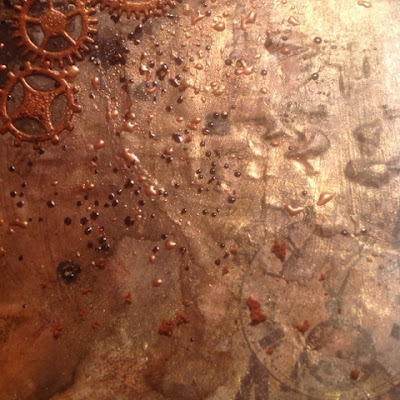 They were dabbed with brown acrylic paint and heat embossed with WOW copper pearl. I adhered them to the card base and proceeded to spray with brown and black to get them to look as if they had always been there... This is the before sprays picture. This photo has been taken in early morning light... 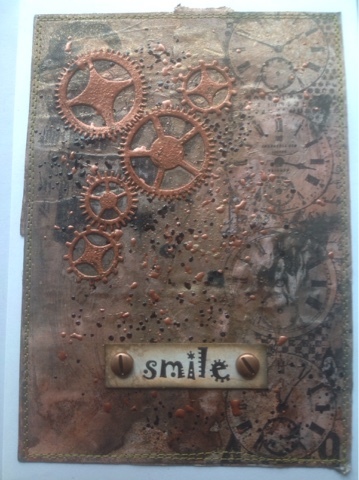 I stamped the "smile" from Rubber Dance on a piece of cardstock and pierced through a couple of screw brads. I love how that font fits with the teeth of the cogs! 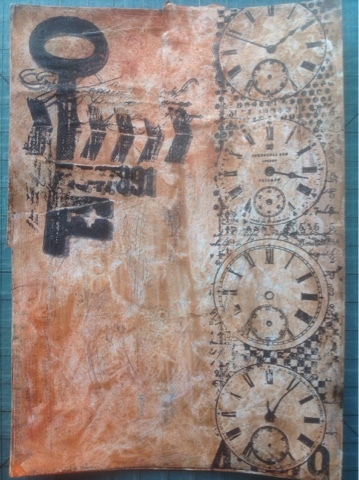 Then the (rather warped) background was adhered to a 5x7 card blank with double sided tape and sewed around. I finished the card with a pile of goodies. The stems of the roses were twirled around a pin and I found some matching green embroidery thread. 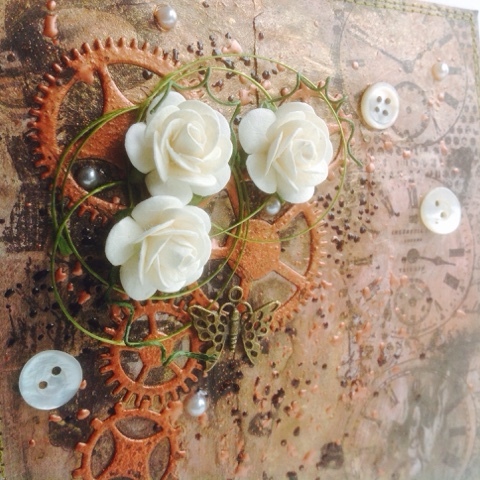 Half pearls, old mother of pearl buttons and a bronze butterfly... this won't fit in any envelope, but I love it! 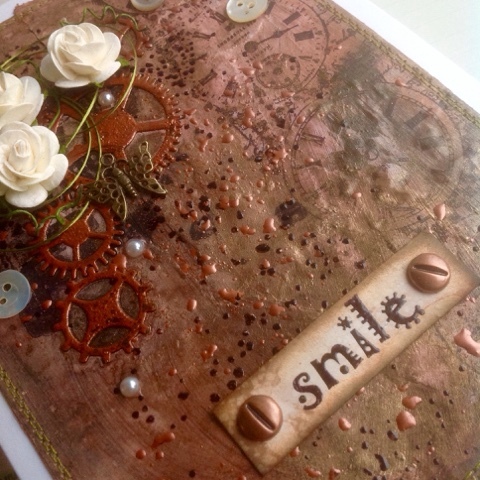 Love those splatters of metal embossing powder! They are a brilliant addition to your great project! Really pretty! Love the contrast! Love this, the roses and buttons are wonderful touches. 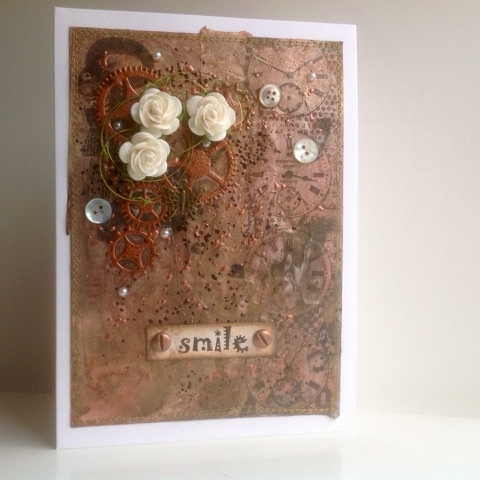 Love the gooey embossing you did, great tip!